Travel to Africa is often seen as exciting, adventurous, exotic, and perhaps a little dangerous. Westerners may typically imagine safaris and African animals, jungles, or perhaps poverty, whilst the north of Africa brings images of deserts and camels. 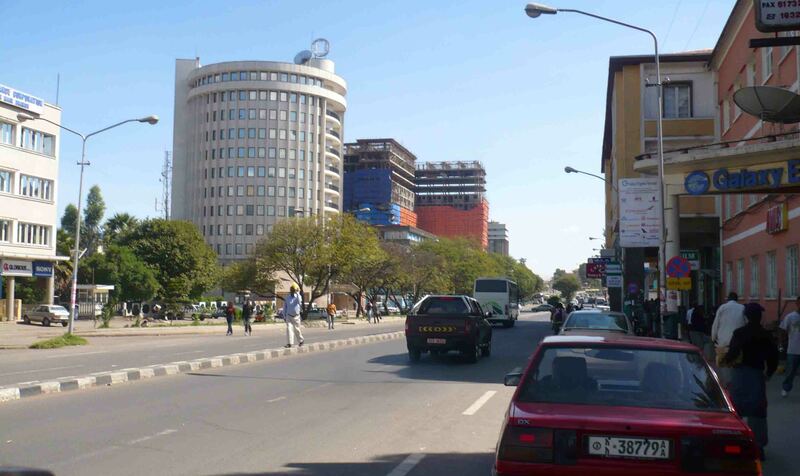 If there is one country in Africa that can defy most expectations, though, that country has to be Ethiopia. 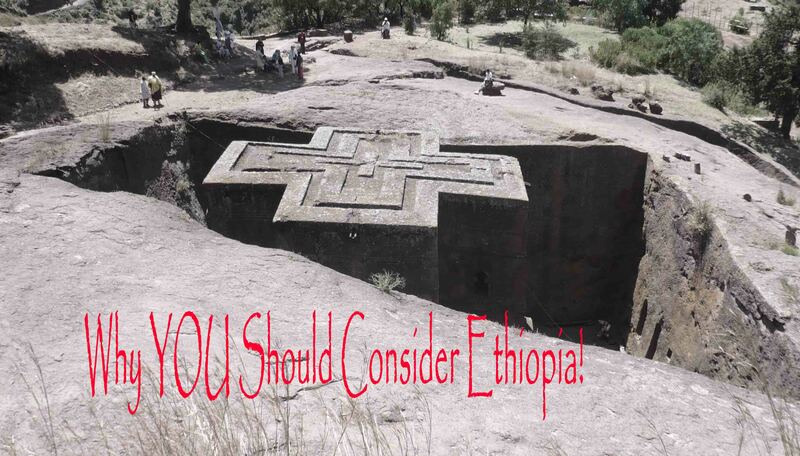 Firstly, the history of Ethiopia is quite different to the rest of Africa. Bar a short occupation during the Second World War by Italy, they have never been under the thumb of a European colonial power. There almost unblemished record of independence is quite unique in that part of the world. 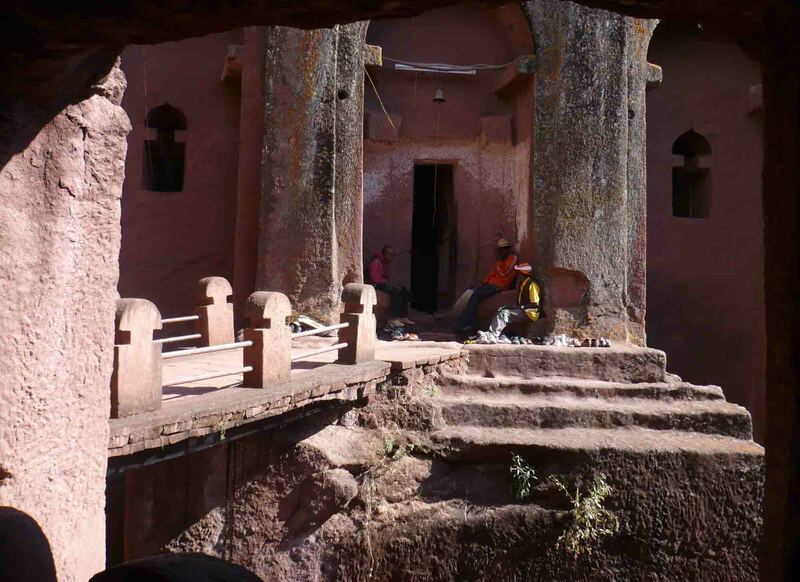 Church of St George, Lalibela. When I visited I couldn’t help but feel that there is something inherently ‘Ethiopian’, and people are rightly proud that their culture is so distinct. This is linked to their history too, one of the world’s first Christian societies. 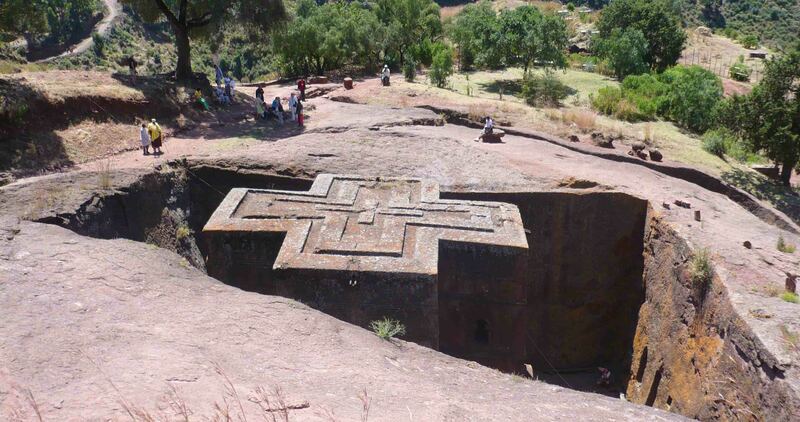 Lalibela is a town famous for it’s rock-hewn churches, carved straight down into rock and hollowed out, which date back over 800 years. One of the main roads in Addis Ababa. 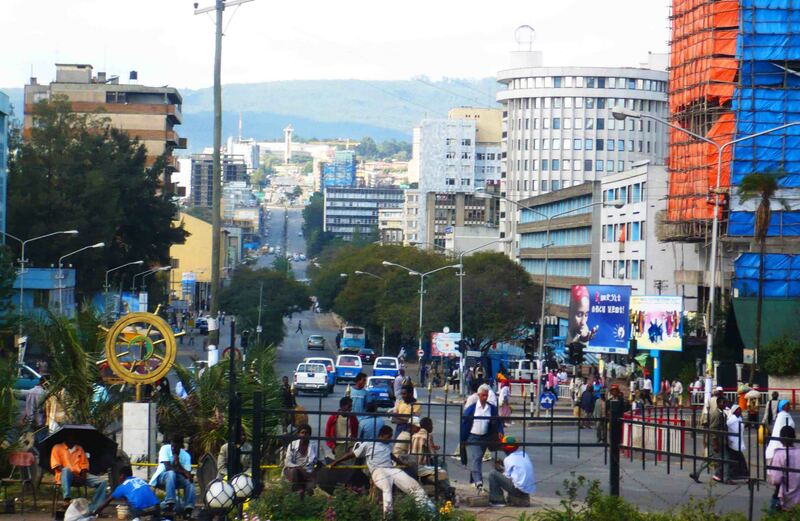 Most visitors will fly into Addis Ababa, an interesting capital city at just over 2,300 metres elevation. Which means it’s a lot cooler than other cities that near to the equator. It bustles and flows to its own rhythm, and again is quite unique, I can’t really think of a city or place with a similar feel to Addis Ababa. And quite a fair portion of Ethiopia is at altitude – higher than 2000 metres. The northern part of the country from Addis north to Eritrea is mostly higher than 2000 metres. The south, heading towards Kenya, is not. So it has more of a tropical feel. And then the far east of the country, towards to borders of Somalia and Somaliland, is desert. I haven’t been to this area. 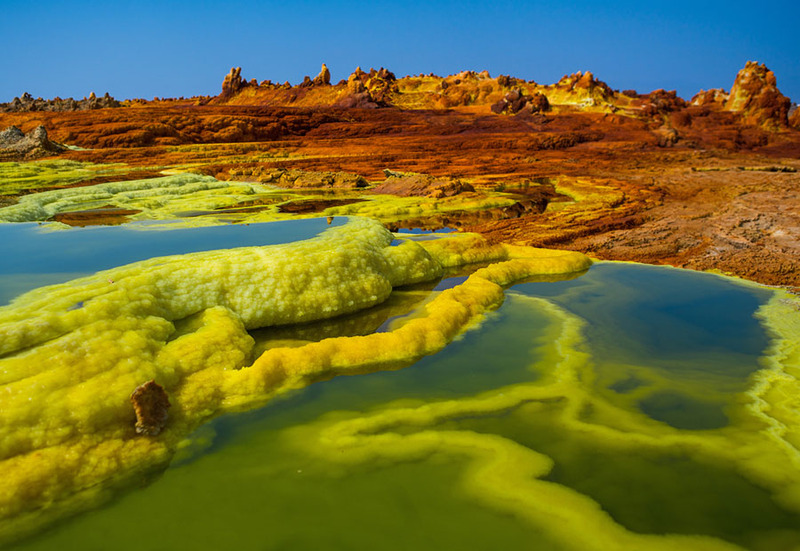 Somewhere in the middle of the desert is the Danakil Depression, one of the lowest points on Earth. There are hot springs there in the middle of the desert, 100 metres below sea level, and in the summer the temperatures can easily exceed 50 degrees Celsius. The east though is also the poorest area of the country, and the area most likely to be affected by famine. Personally, I’ve only been to the north. 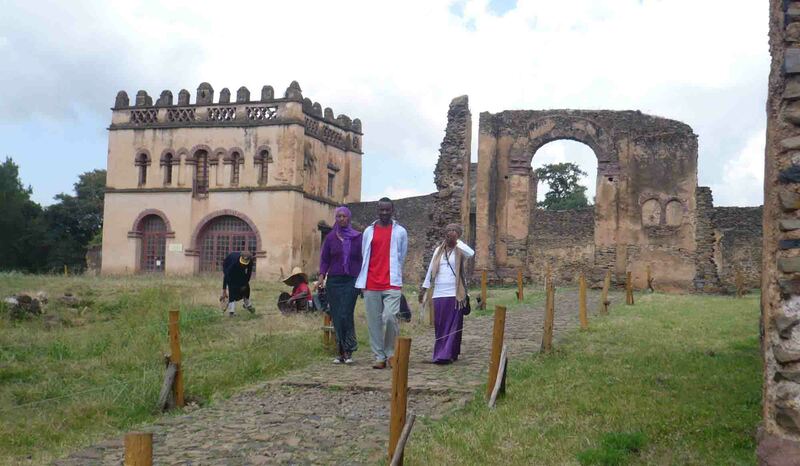 In addition to the history of Lalibela, you have Gondar, an ancient seat of power in Ethiopia and a town with an impressive castle and city walls. 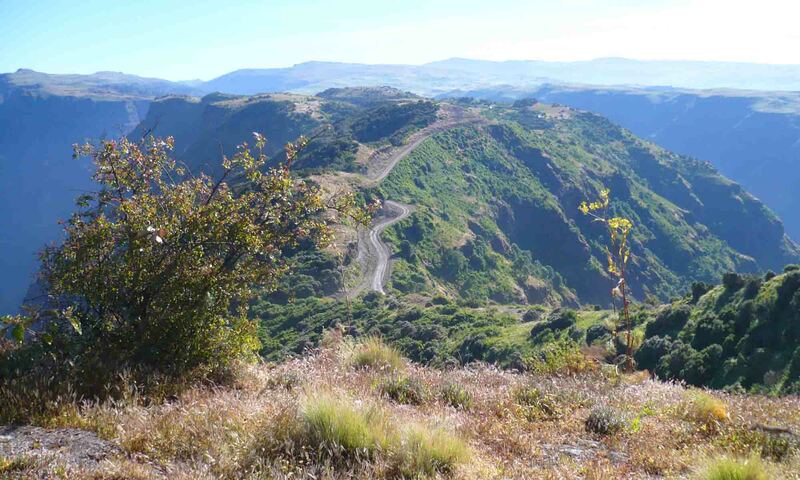 From there you can head further north, where there is some fantastic hiking at over 3000 metres in the Simien Mountains. The altitude of Northern Ethiopia keeps the temperature down most of time, but at night in Simiens it will dip below zero. 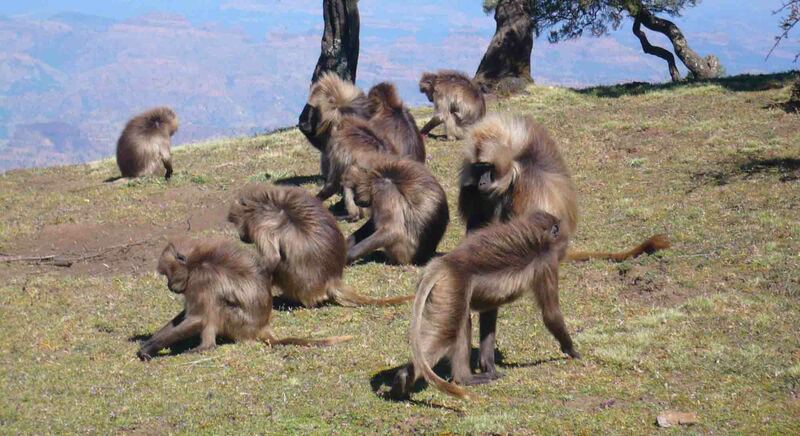 The mountains are full of life, from people, to bird life and gelada baboons. It’s a high rewarding hike that took me above 4000 metres but you can climb even higher should you wish to. No electricity, only the basics, it’s an awesome adventure and one that as yet has not been properly taken over by big tour companies (although I’m sure some do it). 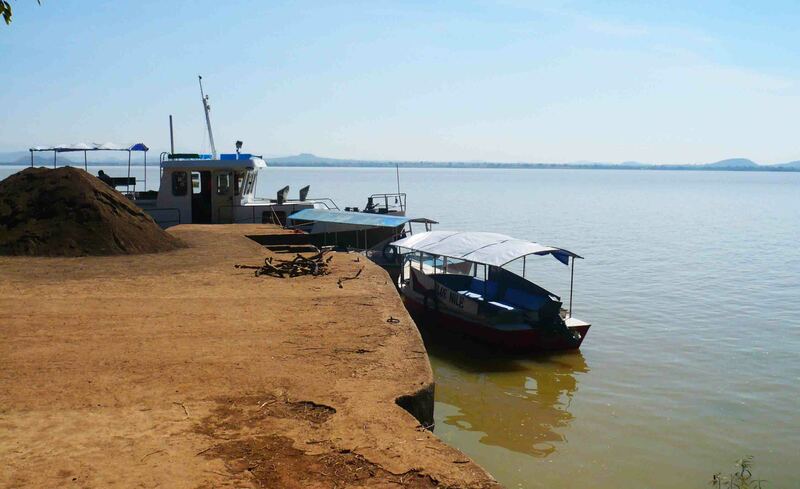 Bahir Dar is north-west of Addis, and situation on a beautiful lake, Lake Tana. 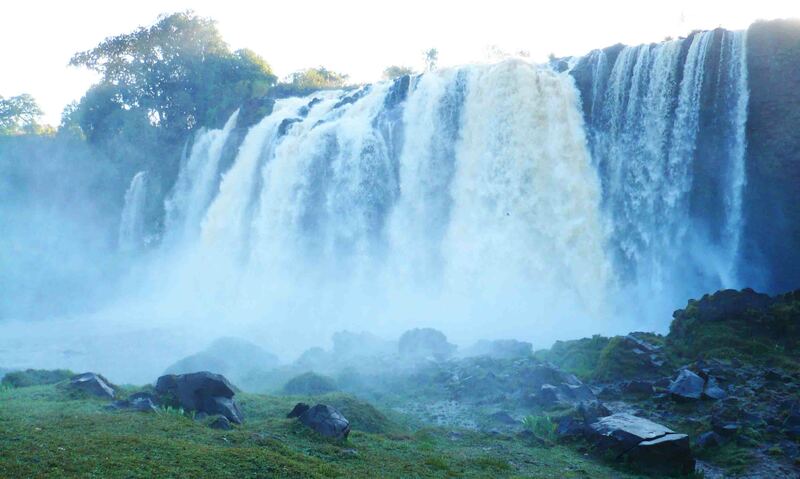 Visit the monastery on the island, or take a half day journey to the Blue Nile falls, a stunning waterfall nearby. Yes – you might be surprised to learn that the Blue Nile flows through Ethiopia, another fun fact (:P) about this amazing country. Injera under several different Ethiopian foods. 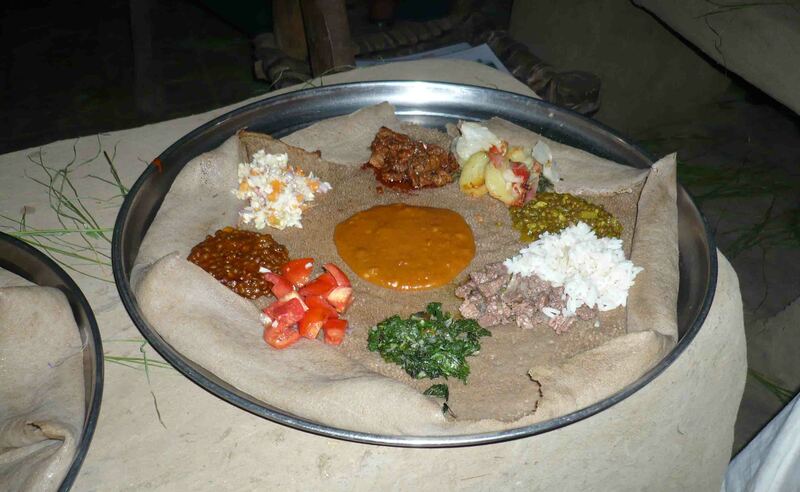 The cuisine is also absolutely unique in Ethiopia. No place like it with the injera bread, like a large pancake, fluffy but sour which you use to help you eat stews and the like. It’s very spicy – be warned, but has a flavour all of its own. For those looking for familiar fare, a pizza is usually not far away. Ethiopia also will not break the bank, it’s one of the cheaper countries in Africa, and you’ll find it pretty decent value. It is also famous for its wine and coffee – in fact coffee is ragingly popular in Ethiopia. It is brewed constantly through the day in cafes and restaurants, and is usually very strong and without milk. So. 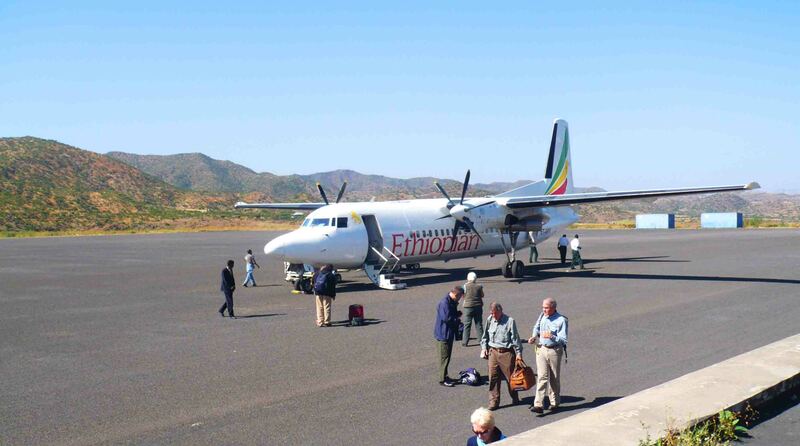 Ethiopia – it’s an adventure, but a grand and exciting one. It IS my favourite country in Africa, and I highly recommend it. So what are you waiting for? Thanks for reading today, and May the Journey Never End! Nice post Andy, don’t know much about Ethiopia. You mentioned the hike and animals – nothing that can eat you? hmmmm well you take a ‘guard’ with you with a gun for animals. 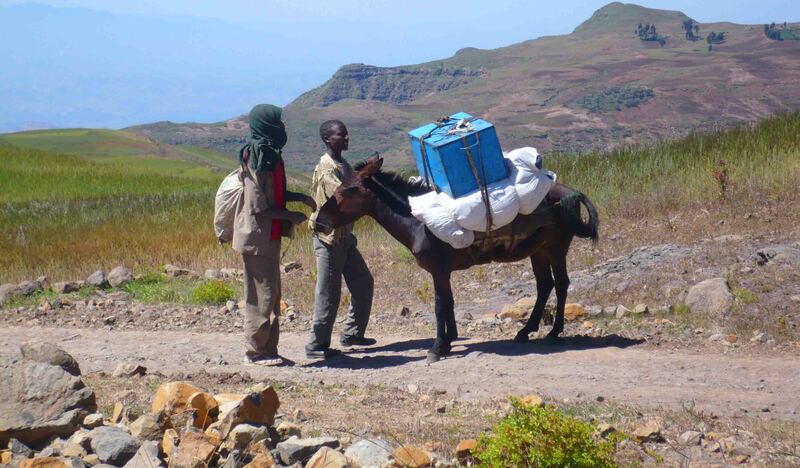 But I don’t think anything is THAT dangerous in the Simiens. but i could be wrong there too! Certainly none of Africa’s notorious carnivores! Maybe wild dogs (or hyenas). Thanks for commenting! Very cool! I am interested in the country as I love traveling but nobody ever writes about it. Good read, thanks for sharing.